Le Levain is a French bakery in Trastevere which serves all kinds of French delicacies from macarons and eclairs to Sablè Bretons and Croque Monseiurs. The place is run by a chef from Puglia named Giuseppe Solfrizzi. He was inspired by French pastries and Belgian chocolates and felt a desire to open his own shop. Upon entry, the aroma of fresh baked bread, butter, and the sweet smell of pastries engulfs you. It is warm and welcoming and always invites me to stay inside for a cup of coffee. The prices aren't bad. Sure, each pastry is maybe twenty cents more expensive than the average bakery, but the quality of the food is much higher. I stop by here on my way to class about once a week. It has become one of my absolute favorites in Rome! What a great find! Yes, it was a stark difference from France to Italy when it came to finding baked goods. I would forego the stale Italian snacks in a heartbeat. OMG I can practically smell the aroma through these pictures. It reminds me of a few bakeries I used to go to in Chicago. Unfortunately, I live in a tiny town in SC now and my only bakery is attached to the small grocery store. Thanks for the trip. Those pastries look amazing! I love the ones with the fresh fruit on top. How cool that you get to study in Rome! This looks like a delicious place to stop in for a treat! But then I'd stop in anywhere for an eclair - I love them! Those macaroons look amazing! It's so exciting and cool that you are spending so much time in Rome! It is definitely on my bucket list! Okay, well I'm drooling. Everything looks so delicious! I love pastries. As I'm reading your post, I am munching on some celeries and carrots as snacks.. Obviously, my snack does not compared to those pastries! I want some instead of the healthy veggies! They look amazing! I just had dinner and so these sweets would be the nice finish to the evening! Yummy looking! All of those treats look so amazing. I would love to give each one of them a try and also visit Rome! oh my gosh. I absolutely love the food in Europe. The food over here in the states just can't compare lol. Those are almost too pretty to eat though! Everything looks so tasty. Those chocolate croissants are calling my name. What a lovely place to go to for desserts! I would go here everyday if I lived near as well. Everything just looks delightful and yummy! These pastries looks so yummy! i want to visit europe. 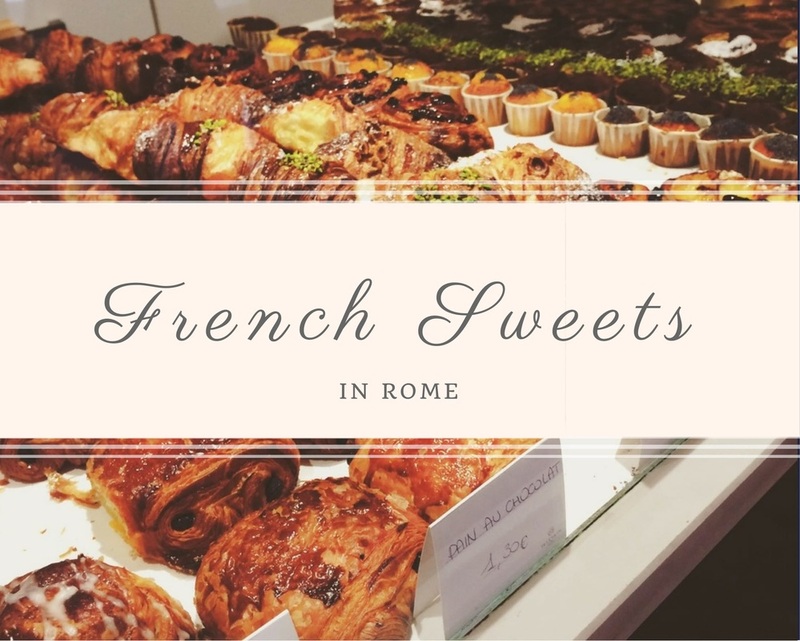 How fun to find french sweets while you were in Rome. We love discovering amazing places. I really wish to someday visit here!! Those sweets would be the icing on the cake. I want it all!! I just had a good look through your blog. looks great, loved this one, but also loved looking at all the other pics from all over the world. Nice blog to get travel destination ideas. Growing up in Japan. I have been to many bakeries that take their inspiration from bakeries in France. I have yet to visit France and their bakeries and it's high on my bucket list!!! I have the biggest sweet tooth...I am the biggest sweep eater. I love European dessert so good.